Hemicrania continua (HC) is an indomethacin responsive primary headache disorder which is characterized by a continuous and strictly unilateral headache, with cranial autonomic symptoms and agitation during the episodes of pain exacerbation. It was first described by Medina and Diamond in 1981. The term “HC” was coined by Sjaastad and Spierings in 1984. It was first incorporated into the International Headache Society classification system in 2004 (second edition) under the heading of “other primary headaches.” However, in the third edition of the International Classification of Headache Disorder (ICHD-3 β, 2013), it has been put under the heading of trigeminal autonomic cephalalgias (TACs) with cluster headache (CH), paroxysmal hemicranias (PH), Short-lasting, unilateral, neuralgiform headache attacks with conjunctival injection and tearing (SUNCT), and short-lasting unilateral neuralgiform headache attacks with cranial autonomic symptoms (SUNA). A response to indomethacin is an essential feature in the diagnostic criteria of HC. This makes it difficult to estimate the true prevalence of (definite) HC in any epidemiological study. The Vaga study noted 18 patients with probable HC in 1,838 parishioners (1.0%). Initially, it was considered as a rare disease. There were only 100 cases of HC in the literature in the first 17 years of its discovery (1984–2001). However, various large case series have been published in the recent past. Several authors have suggested that HC is not rare and it is probably underdiagnosed and underreported condition. In a recent review, Prakash and Patel noted >1000 cases of HC in the literature. HC constitutes 1.3%–2.3% (mean-1.7%) of total headache patients in the clinic settings. In a pooled analysis of the strictly unilateral headaches, HC was the fourth most common etiology for the side-locked headaches (after CH, side-locked migraine and cervicogenic headache). After CH, it is probably the second most common TACs. HC typically starts in the fourth or fifth decade of life. More than 80% patients in Marmura et al. series (36 out of 43 patients) were more than 30-year-old. About 70% patients were more than 40-year-old at the onset of HC in Cortijo et al. series of 36 patients. The pooled mean age of onset was 40 years in Prakash and Patel review. However, patients as young as 5 years  and as old as 76 years  have been reported. HC is classically considered a disease with a female preponderance. The female: male ratio was 5:1 in the first review on HC. This ratio has reduced over the years. Now, this female: male ratio is closer to 1.8:1. There is just one case report of familial HC, and so far, no genetic predisposition has been established. HC is a subtype of TACs. Therefore, its clinical features overlap with other TACs. TACs are classically characterized by strictly unilateral pain in the trigeminal distribution and cranial autonomic symptoms (CAS) in the same areas. There are two components of HC: (i) continuous background unilateral headache and (ii) superimposed severe exacerbations. Continuous background headache is the central feature of HC. The background pain is typically dull and mild-to-moderate in intensity. The intensity of background pain varies from 3.3 to 5.2 in visual analog scale (VAS) (range 0–10).,, The background pain does not hamper physical activity. Majority of the patients report superimposed exacerbations over the background pain. The superimposed exacerbations are extremely variables in the terms of character, intensity, duration, and frequency. The character of pain during exacerbation is typically throbbing or stabbing (jabs and jolts). The intensity of exacerbations is usually severe to very severe. The pooled mean VAS of exacerbations pain was 9.0 in Prakash and Patel analyses. Almost all patients have some form of physical disability with the exacerbation. Just like CH and PH, about 50% patients in Cittadini series reported that their pain was the most painful condition they had ever experienced, comparing it to labor pain, a broken bone, toothache, and burned hands. Patients with HC may have suicidal thoughts during severe exacerbations. CH is widely recognized as a most painful condition. However, clinical characteristics of HC during exacerbations suggest that it may be as severe as of CH attacks in a subset of HC patients. The frequency and duration are well defined in the diagnostic criteria of CH, PH, and SUNCT/SUNA. However, the pattern of exacerbations of HC is highly variable in the terms of frequency and duration. The duration of exacerbations may vary from a few seconds to 2 weeks. Whereas the mean length of exacerbations was 32 min in Cortijo et al. observations, it was 31 h in Benítez-Rivero et al. study. The duration of exacerbations may vary from attack per attack in the same patient. The frequency of the exacerbations is also highly variable. It may vary from >20 attacks in a day to one attack in 4 months duration.,,, About 49%–60% patients report at least one attack daily., About 17% patients had >5 attacks in a day in Prakash and Golwala observations. Ipsilateral cranial autonomic features are one of the cardinal features of all five TACs. ICHD-3 β describes 10 different types of cranial autonomic features in relation to TACs. These CAS are related to eye/eye lid (conjunctival injection, lacrimation, ptosis, meiosis, and eyelid edema), nose (nasal congestion and rhinorrhea), ear (sensation of fullness in the ear), and face/forehead (sweating and flushing). The mean prevalence of CAS during exacerbations is about 74%. This prevalence is slightly lower than the prevalence of CAS observed in CH and PH patients. Tearing and conjunctival injection are two most common cranial autonomic feature.,, Less frequent autonomic features such as ptosis, miosis, eyelid edema, and facial sweating may also occur with exacerbations. A sense of aural fullness has been recently incorporated as one of the autonomic features in ICHD-3 β criteria. It was reported in 19% cases in Cittadini et al. case series. A feeling of foreign body sensation in the eye (or sand in eye sensation or itching eye) is a peculiar feature during exacerbation of HC. It may be noted in more than one-third patients with HC.,, It is considered as a part of CAS. It is not reported in other TACs or any other primary headache disorder. Intensity and components of CAS are usually meager in HC as compared to other TACs., The patients may not be aware of its presence. Therefore, an objective assessment of the patients for the presence CAS during exacerbations should be done in doubtful cases of HC. Just like CH and other TACs, HC patients may have restlessness during exacerbations. It is noted in about 50% of HC patients.,, They may show pacing or jogging like activity. The patients may rock from side to side, hit their heads, or even hit the head against the wall. They may press on the eye or temples with the hand or a cloth or with an ice pack. Patients find difficulty in sitting or lying down comfortably during exacerbations. Restlessness or agitation has recently been included in HC criteria. It provides an alternative to cranial autonomic features in the diagnostic criteria. Migrainous features (nausea, vomiting, photophobia, and phonophobia) are quite common in patients with HC during exacerbations. The mean prevalence of at least one migrainous feature was 60% in Prakash and Patel observation. About 56% fulfilled the migraine criteria during exacerbation phase. However, auras are not that common. There are just a few case reports of visual auras in HC., One case with olfactory aura has also been reported in the literature. As there are considerable overlaps among the TACs, it has been hypothesized that all TACs have a common pathophysiology. However, the pathophysiological studies on HC are relatively sparse. A PET study in HC patients has demonstrated the activation of the contralateral posterior hypothalamus, ipsilateral dorsal rostral pons, ipsilateral ventrolateral midbrain, and bilateral pontomedullary junction. A number of hypothalamic connections have been suggested for the clinical features of TACs, including HC. The orexinergic system is probably the main circuit to influence the hypothalamus in patients with HC and other TACs. Somatostatinergic, serotoninergic, and opioidergic circuits may also modulate hypothalamus. It has been suggested that dysfunction in the hypothalamus may result in destabilization of various inputs on the trigeminovascular system, leading to various clinical features of HC and other TACs. The cranial autonomic features of TACs are probably because of the central disinhibition of the trigeminal autonomic reflex by the hypothalamus, possibly through direct hypothalamic-trigeminal connections. The diagnosis of HC is made according to ICHD-3 β criteria [Table 1] for HC and exclusion of a secondary cause. Prakash and Patel noted 66 cases of secondary HC in a recent review. There are a total 25 different pathologies related to secondary HC in the literature. A few secondary HC may be temporally related to certain events (head injury, intracranial surgeries, other surgeries, and postpartum state). A large number of secondary HC (up to 55%) are related to such events. Posttraumatic headache is the most common secondary HC., It constitutes 39% of total cases of secondary HC. Postcraniotomy HC is the second most common secondary HC. Event-related secondary HC is mostly benign. Therefore, a history inquiring about such events preceding the onset of HC is very important. Once you rule out secondary HC, a diagnosis of primary HC can be made according to ICHD-3 β criteria for HC [Table 1]. The criteria seem to be easy. However, a misdiagnosis is very common for HC. A misdiagnosis of HC is perhaps maximum among all primary headache disorders. The pooled mean delay of diagnosis for HC is 8 ± 7.2 years. A case of HC is missed by even neurologists and headache experts. None of the neurologists and headache experts made the correct diagnosis of HC in Rossi et al. series of 25 patients. 20 neurologists, and seven headache experts had seen these case before. Another important feature of HC is “immediate reappearance of headache (within 6–24 h) on skipping indomethacin.” Antonaci and sjaastad, and a few other authors advocated that its diagnostic value (i.e., reappearance of headache after skipping of indomethacin) is stronger than INDOTEST itself., A subset of HC patients may show a complete or excellent response to drugs other than indomethacin. A few patients may receive such effective drugs even without getting a correct diagnosis of HC. The skipping or withdrawal of even such drugs may lead to immediate reappearance of headaches. Therefore, if patients with side-locked headaches had a history of complete or excellent response to some drugs as long as they had continued those drugs, a possibility of HC exists, as no other headache reappears so fast on withdrawal of the effective drugs. ICHD-3 β identifies two forms of HC (i) HC, unremitting subtype and (ii) HC, remitting subtype. In remitting HC, the pain is not continuous but is interrupted by remission periods of at least 1 day. Remitting form HC constitutes 15% of total HC., Unremitting HC is characterized by the continuous pain for at least 1 year, without any symptom-free period. Unremitting HC can arise de novo (i.e., chronic from the onset) may or evolve from HC, remitting subtype. About 50%–60% HC have the unremitting subtype from onset. Other 25%–35% HC evolved into unremitting subtype from the remitting form. Recognizing the continuous pain in any side-locked headache is the essential step for making a diagnosis of HC. However, the patients may be more worried for the superimposed exacerbations. The patients may not utter anything about background headaches, and even physician may miss to ask about the background headaches. The frequency and duration of the headache attacks are the important clinical clues for diagnosing various primary headaches, neuralgias, and even secondary headaches. Therefore, if you ignore the continuous background pain and put emphasis only on the exacerbations, the (mis) diagnosis will depend on the frequency, duration, and other characteristics associated with exacerbations. As the duration of the exacerbations in HC vary from a few seconds to a few days, the diagnosis may include side-locked migraine, other TACs (CH, PH, and SUNCT/SUNA), neuralgias (especially supraorbital and trigeminal neuralgia), etc. Rarely, superimposed exacerbations are not severe or physicians concentrate only on the continuous pain (ignoring exacerbations), the differential diagnosis could be new daily persistent headache (NDPH), atypical facial pain, CTTH, and various local pathologies. Migraine is the most common misdiagnosed condition for HC., Up to 71% patients of HC may fulfil the diagnostic criteria of migraine during exacerbations. The treatment modalities and the natural course of migraine and HC are entirely different. Therefore, it is a challenge to differentiate HC with migraine. [Table 2] highlights the differentiating features between two. Features that distinguish HC from side-locked migraine include older age of onset, continuous daily pain, ipsilateral cranial autonomic features, and agitation during attacks. The restlessness or agitation during painful attacks may be the best clinical clue to differentiate HC from migraine, as migraineures are quiet and avoid any movement. Response to previously used drugs (other than indomethacin) may also give some hints. Typically, HC does not respond to drugs other than indomethacin. Therefore, if a side-locked migraine has not shown any response to any antimigraine and other drugs, think about an alternative diagnosis (HC). However, a subset of patients with HC (without getting a correct diagnosis) may show response to various other drugs. However, there will be immediate relapse of symptoms on skipping the drugs. Therefore, if patients with side-locked migraine claim that they get response as long as they continue drugs and symptoms reappear on skipping the drugs, think about a possibility of HC. There are marked similarities among all TACs. They all have maximum pain in the trigeminal distribution (V1), ipsilateral cranial autonomic features, and agitation. The fundamental feature of HC and other TACs is strictly unilateral (maybe side-shifting, but always unilateral). TACs constitutes more than one-third cases (35%) of side-locked headaches in clinic settings. Therefore, a strictly unilateral headache always raises a possibility of TACs. A mnemonic-3As for side-locked headache-have been suggested to identify TACs. 3As includes (i) Anteriorly located (orbital, frontal, and temporal) pain, (ii) autonomic features in the same area (ipsilateral) during attacks/exacerbations, and (iii) Agitation or restlessness during attacks/exacerbations. If all three components of 3As are present, it is one of the forms of TACs. Even with the presence of 2As in a side-locked headache, a possibility of one of the TACs is very high. One TAC can be differentiated with other TACs on the basis of the pattern of the headaches (frequency and duration). Whereas CH, PH, and SUNCT/SUNA are episodic disorders, HC patients have a continuous headache with exacerbations. The attack duration and frequency are quite predictable in SUNCT/SUNA, PH, and CH. The duration of attacks in SUNCT, PH, and CH is <10 min, 2–30 min, and 15–180 min, respectively. However, the attack duration in HC (exacerbations) is highly variables, and many attacks are very prolonged (more than the upper limit of CH i.e., >3 h). A few patients with chronic CH and chronic PH may have interparoxysmal pain and may simulate HC. However, the interparoxymal pain is usually not felt throughout the day and it is usually mild in the intensity. Moreover, a variable pattern of severe attacks (especially of >3 h) will suggest HC. Always ask about the presence of continuous background pain in patients with CH in whom significant proportions of attacks are >3 h.
HC and NDPH are, by definition, continuous daily headache. Up to 18% patients with NDPH may have strictly unilateral headache. Mild autonomic features may also be noted in NDPH. Side-locked NDPH with migrainous features may mimic HC. If patients remember the exact onset of their headaches (1st day of continuous headache), a possibility of NDPH is likely. In doubtful cases, a trial of indomethacin can be given to find out HC. A large number of other primary headaches have been reported in patients with HC. There can be three different types of association. (i) Both headache disorder existing simultaneously: CH is the most common associated headache with HC., Other reported headaches are migraine, TTH, trochlear headache, sexual headache, and trigeminal neuralgia, (ii) other primary headache orders evolving into HC: there are case reports where CH, PH, SUNCT, migraine, and Raeder syndrome  have evolved into HC, (iii) HC evolving into other primary headaches: there are two such cases where HC have transformed into other headaches (PH and LASH syndrome). The diagnosis of such association is very important for therapeutic purpose. Patients may require two different class of drugs at a same time (if both headaches exist simultaneously) or there may be need to change the previously used drug (if one headache have transformed into other). A response to indomethacin usually starts immediately. However, the patients may take time to show a complete response (depending on the duration of titration of effective doses). Patients with longer duration may have delayed response. In Prakash and Golwala observation, 20% patients took >4 weeks to show complete response to indomethacin. A gradual reduction of the dose is recommended every 3–6 months to find out the lowest effective dose in particular patients, as about 60% HC patients may need a lower dose with the passage of time. In this way, we can also find out the remitting form of HC. Dose reduction is usually done by 25 mg every 3 days, until either the pain resurfaces or the patient gets completely off indomethacin. About 20%–75% may develop indomethacin-related side effects and may require alternative drugs. Various drugs have been found effective in case reports and open-label studies. It includes COX-2 inhibitors (celecoxib and rofecoxib,), topiramate, melatonin, gabapentin, ibuprofen, piroxicam, naproxen, aspirin, acemethacin verapamil, and steroids. However, the response of these all drugs are not predictable and may not show any response in a particular patient. You can find the best effective drug only by trial and error method. Surgical interventions can be tried in patients who are intolerant to indomethacin. [Table 3] summarizes the various surgical interventions tried in HC patients. The nosological status of HC is still debatable. Currently, it has been put into Group-3 under TACs. However, a few authors believe that it should not be the part of TACs. The diagnostic criteria for HC have been revised several times over two decades. However, no large case study has been reported following present ICHD-3 β (2013) criteria. The most debatable part in the criteria is about “complete response to indomethacin.” ICHD-3 β exclude the existence of indomethacin resistant HC. However, there are several large case series of typical HC-phenotype headache, but without showing any response to indomethacin., The literature is silent on how to classify/diagnose patients with HC-phenotype who do not show response to indomethacin. The literature acknowledges that several drugs (other than indomethacin) may produce complete response in a subset of patients with HC. However, such patients may not receive the correct diagnosis of HC in the event that a response of other medication occurs before a trial of indomethacin. Medina JL, Diamond S. Cluster headache variant. Spectrum of a new headache syndrome. Arch Neurol 1981;38:705-9. Sjaastad O, Bakketeig LS. The rare, unilateral headaches. Vågå study of headache epidemiology. J Headache Pain 2007;8:19-27. Prakash S, Patel P. Hemicrania continua: Clinical review, diagnosis and management. J Pain Res 2017;10:1493-509. 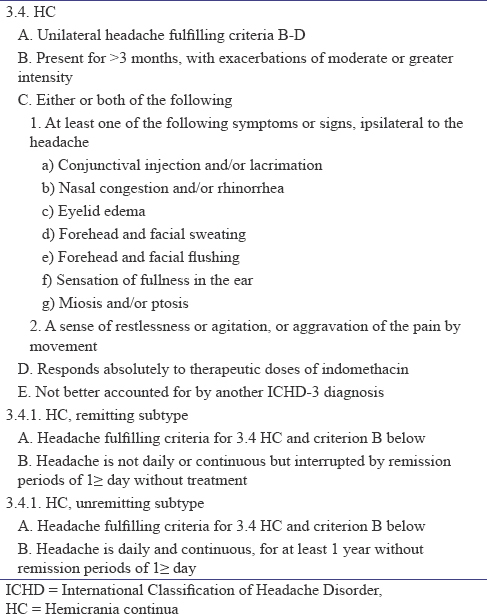 Prakash S, Rathore C. Side-locked headaches: An algorithm-based approach. J Headache Pain 2016;17:95. Marmura MJ, Silberstein SD, Gupta M. Hemicrania continua: Who responds to indomethacin? Cephalalgia 2009;29:300-7. Cortijo E, Guerrero-Peral ÁL, Herrero-Velázquez S, Mulero P, Pedraza M, Barón J, et al. Hemicrania continua: Characteristics and therapeutic experience in a series of 36 patients. Rev Neurol 2012;55:270-8. Wheeler S. Clinical spectrum of hemicrania continua. Neurology 2000;54:A422. Bordini C, Antonaci F, Stovner LJ, Schrader H, Sjaastad O. “Hemicrania continua”: A clinical review. Headache 1991;31:20-6. Weatherall MW, Bahra A. Familial hemicrania continua. Cephalalgia 2011;31:245-9. Newman LC, Lipton RB, Russell M, Solomon S. Hemicrania continua: Attacks may alternate sides. Headache 1992;32:237-8. Newman LC, Spears RC, Lay CL. Hemicrania continua: A third case in which attacks alternate sides. Headache 2004;44:821-3. Baldacci F, Nuti A, Cafforio G, Lucetti C, Logi C, Cipriani G, et al. 'INDOTEST' in atypical hemicrania continua. Cephalalgia 2008;28:300-1. Marano E, Giampiero V, Gennaro DR, di Stasio E, Bonusa S, Sorge F, et al. “Hemicrania continua”: A possible case with alternating sides. Cephalalgia 1994;14:307-8. Peres MF, Masruha MR, Young WB. Side-shifting hemicrania continua with aura (migraine with aura with autonomic symptoms responsive to indomethacin?) Cephalalgia 2006;26:917-9. Matharu MS, Bradbury P, Swash M. Hemicrania continua: Side alternation and response to topiramate. Cephalalgia 2006;26:341-4. Pasquier F, Leys D, Petit H. “Hemicrania continua”: The first bilateral case? Cephalalgia 1987;7:169-70. Iordanidis T, Sjaastad O. Hemicrania continua: A case report. Cephalalgia 1989;9:301-3. Trucco M, Antonaci F, Sandrini G. Hemicrania continua: A case responsive to piroxicam-beta-cyclodextrin. Headache 1992;32:39-40. Southerland AM, Login IS. Rigorously defined hemicrania continua presenting bilaterally. Cephalalgia 2011;31:1490-2. Prakash S, Shah ND, Chavda BV. Unnecessary extractions in patients with hemicrania continua: Case reports and implication for dentistry. J Orofac Pain 2010;24:408-11. Alonso AA, Nixdorf DR. Case series of four different headache types presenting as tooth pain. J Endod 2006;32:1110-3. Benoliel R, Robinson S, Eliav E, Sharav Y. Hemicrania continua. J Orofac Pain 2002;16:317-25. Taub D, Stiles A, Tucke AG. Hemicrania continua presenting as temporomandibular joint pain. Oral Surg Oral Med Oral Pathol Oral Radiol Endod 2008;105:e35-7. Benítez-Rivero S, González-Oria C, Gómez-Caravaca T, Bernal Sánchez-Arjona M, Jiménez-Hernández MD. Hemicrania continua and paroxysmal hemicrania: Clinical and therapeutic characteristics in a series of 23 patients. Rev Neurol 2014;59:337-44. Newman LC, Lipton RB, Solomon S. Hemicrania continua: Ten new cases and a review of the literature. Neurology 1994;44:2111-4. Prakash S, Golwala P. A proposal for revision of hemicrania continua diagnostic criteria based on critical analysis of 62 patients. Cephalalgia 2012;32:860-8. Peres MF, Stiles MA, Oshinsky M, Rozen TD. Remitting form of hemicrania continua with seasonal pattern. Headache 2001;41:592-4. Peres MF, Siow HC, Rozen TD. Hemicrania continua with aura. Cephalalgia 2002;22:246-8. Fantini J, Koscica N, Zorzon M, Belluzzo M, Granato A. Hemicrania continua with visual aura successfully treated with a combination of indomethacin and topiramate. Neurol Sci 2015;36:643-4. Kuhn J, Kuhn KF, Cooper-Mahkorn D, Bewermeyer H. Remitting form of hemicrania continua: Two new cases exhibiting one unusual autonomic feature. Headache 2005;45:759-62. Prakash S, Hansen JM. Mechanisms of cluster headache and other trigeminal autonomic cephalalgias. In: Martelletti P, Timothy J, Steiner TJ, editors. Handbook of Headache: Practical Management. 1st ed. Berlin: Springer Verlag; 2011. p. 330-40. Malick A, Strassman RM, Burstein R. Trigeminohypothalamic and reticulohypothalamic tract neurons in the upper cervical spinal cord and caudal medulla of the rat. J Neurophysiol 2000;84:2078-112. Prakash S, Shah ND, Soni RK. Secondary hemicrania continua: Case reports and a literature review. J Neurol Sci 2009;280:29-34. Eross EJ, Swanson JW, Dodick DW. Hemicrania continua: An indomethacin-responsive case with an underlying malignant etiology. Headache 2002;42:527-9. Evans RW. Hemicrania continua-like headache due to nonmetastatic lung cancer – A vagal cephalalgia. Headache 2007;47:1349-51. Robbins MS, Grosberg BM. Hemicrania continua-like headache from metastatic lung cancer. Headache 2010;50:1055-6. Abraham PJ, Capobianco DJ, Cheshire WP. Facial pain as the presenting symptom of lung carcinoma with normal chest radiograph. Headache 2003;43:499-504. Rossi P, Faroni J, Tassorelli C, Nappi G. Diagnostic delay and suboptimal management in a referral population with hemicrania continua. Headache 2009;49:227-34. Antonaci F, Sjaastad O. Hemicrania continua. Handbook of Clinical Neurology. 3rd Series, Vol. 97. Amsterdam: Elsevier B.V; 2011. p. 483-7. Prakash S, Shah ND, Marmura MJ. Hemicrania continua unresponsive to indomethacin do exist. Cephalalgia 2010;30:123-5. Marmura MJ, Young WB. Interictal pain in primary headache syndromes. Curr Pain Headache Rep 2012;16:170-4. Totzeck A, Diener HC, Gaul C. Concomitant occurrence of different trigeminal autonomic cephalalgias: A case series and review of the literature. Cephalalgia 2014;34:231-5. Lisotto C, Mainardi F, Maggioni F, Zanchin G. Hemicrania continua with contralateral episodic cluster headache: A case report. Cephalalgia 2003;23:929-30. Evers S, Bahra A, Goadsby PJ. Coincidence of familial hemiplegic migraine and hemicrania continua? A case report. Cephalalgia 1999;19:533-5. Allena M, Tassorelli C, Sances G, Guaschino E, Sandrini G, Nappi G, et al. Is hemicrania continua a single entity or the association of two headache forms? Considerations from a case report. Headache 2010;50:877-81. Cuadrado ML, Porta-Etessam J, Pareja JA, Matías-Guiu J. Hemicrania continua responsive to trochlear injection of corticosteroids. Cephalalgia 2010;30:373-4. Prakash S. Hyper insulinemia in an hemicrania continua patient with sexual headache: Hypothesizing the basis for this unusual association. Neurol India 2010;58:642-4. Prakash S, Rathore C. Two cases of hemicrania continua-trigeminal neuralgia syndrome: Expanding the spectrum of trigeminal autonomic cephalalgia-tic (TAC-TIC) syndrome. Headache 2017;57:472-7. Lambru G, Castellini P, Bini A, Evangelista A, Manzoni GC, Torelli P, et al. Hemicrania continua evolving from cluster headache responsive to valproic acid. Headache 2008;48:1374-6. Castellanos-Pinedo F, Zurdo M, Martínez-Acebes E. Hemicrania continua evolving from episodic paroxysmal hemicrania. Cephalalgia 2006;26:1143-5. Cosentino G, Fierro B, Puma AR, Talamanca S, Brighina F. Different forms of trigeminal autonomic cephalalgias in the same patient: Description of a case. J Headache Pain 2010;11:281-4. Terlizzi R, Cevoli S, Nicodemo M, Pierangeli G, Grimaldi D, Cortelli P, et al. A case of strictly unilateral migraine without aura transformed in an episodic hemicrania continua. Neurol Sci 2011;32:169-70. Porzukowiak TR. Raeder paratrigeminal neuralgia evolving to hemicrania continua. Optom Vis Sci 2015;92:S81-7. Rozen TD. Indomethacin-responsive TACs (paroxysmal hemicrania, hemicrania continua, and LASH): Further proof of a distinct spectrum of headache disorders. Headache 2013;53:1499-500. Prakash S, Shah ND. Delayed response of indomethacin in patients with hemicrania continua: Real or phantom headache? Cephalalgia 2010;30:375-9. Pareja JA, Caminero AB, Franco E, Casado JL, Pascual J, Sánchez del Río M, et al. Dose, efficacy and tolerability of long-term indomethacin treatment of chronic paroxysmal hemicrania and hemicrania continua. Cephalalgia 2001;21:906-10. Prakash S, Husain M, Sureka DS, Shah NP, Shah ND. Is there need to search for alternatives to indomethacin for hemicrania continua? Case reports and a review. J Neurol Sci 2009;277:187-90. Antonaci F, Pareja JA, Caminero AB, Sjaastad O. Chronic paroxysmal hemicrania and hemicrania continua: Anaesthetic blockades of pericranial nerves. Funct Neurol 1997;12:11-5. Afridi SK, Shields KG, Bhola R, Goadsby PJ. Greater occipital nerve injection in primary headache syndromes – Prolonged effects from a single injection. Pain 2006;122:126-9. Guerrero ÁL, Herrero-Velázquez S, Peñas ML, Mulero P, Pedraza MI, Cortijo E, et al. Peripheral nerve blocks: A therapeutic alternative for hemicrania continua. Cephalalgia 2012;32:505-8. Androulakis XM, Krebs KA, Ashkenazi A. Hemicrania continua may respond to repetitive sphenopalatine ganglion block: A case report. Headache 2016;56:573-9. Weyker P, Webb C, Mathew L. Radiofrequency ablation of the supra-orbital nerve in the treatment algorithm of hemicrania continua. Pain Physician 2012;15:E719-24. Beams JL, Kline MT, Rozen TD. Treatment of hemicrania continua with radiofrequency ablation and long-term follow-up. Cephalalgia 2015;35:1208-13. Schwedt TJ, Dodick DW, Trentman TL, Zimmerman RS. Occipital nerve stimulation for chronic cluster headache and hemicrania continua: Pain relief and persistence of autonomic features. Cephalalgia 2006;26:1025-7. Schwedt TJ, Dodick DW, Hentz J, Trentman TL, Zimmerman RS. Occipital nerve stimulation for chronic headache – Long-term safety and efficacy. Cephalalgia 2007;27:153-7. Burns B, Watkins L, Goadsby PJ. Treatment of hemicrania continua by occipital nerve stimulation with a bion device: Long-term follow-up of a crossover study. Lancet Neurol 2008;7:1001-12. Miller S, Watkins L, Matharu MS. Treatment of intractable hemicrania continua by occipital nerve stimulation. J Neurol Neurosurg Psychiatry 2017;88:805-6. Nesbitt A, Marin J, Goadsby P. Treatment of hemicrania continua by non-invasive vagus nerve stimulation in 2 patients previously treated with occipital nerve stimulation. J Headache Pain 2013;14 Suppl 1:P230. 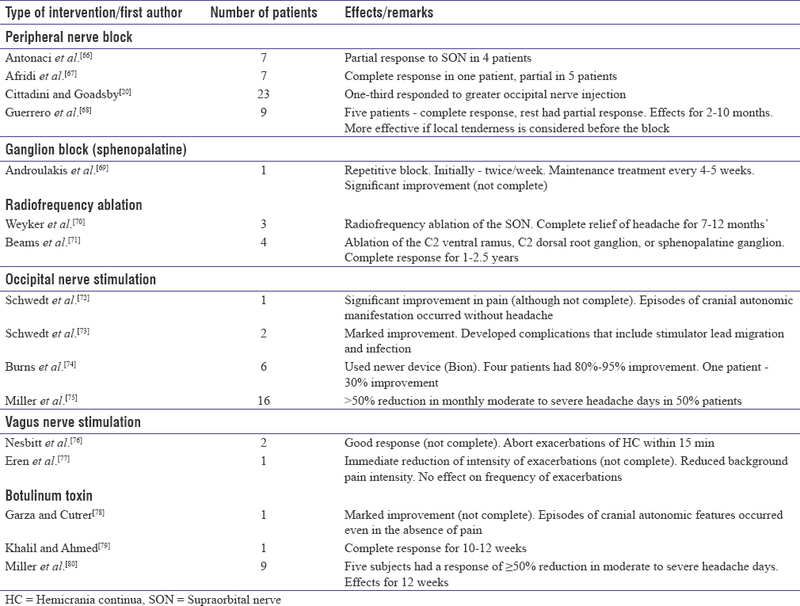 Eren O, Straube A, Schöberl F, Schankin C. Hemicrania continua: Beneficial effect of non-invasive vagus nerve stimulation in a patient with a contraindication for indomethacin. Headache 2017;57:298-301. Garza I, Cutrer FM. Pain relief and persistence of dysautonomic features in a patient with hemicrania continua responsive to botulinum toxin type A. Cephalalgia 2010;30:500-3. Khalil M, Ahmed F. Hemicrania continua responsive to botulinum toxin type a: A case report. Headache 2013;53:831-3. Miller S, Correia F, Lagrata S, Matharu MS. OnabotulinumtoxinA for hemicrania continua: Open label experience in 9 patients. J Headache Pain 2015;16:19. Prakash S, Shah ND, Bhanvadia RJ. Hemicrania continua unresponsive or partially responsive to indomethacin: Does it exist? A diagnostic and therapeutic dilemma. J Headache Pain 2009;10:59-63.